17th century. Spanish bobo, from Latin balbus (“stammering”). The daughter is said to be well-bred and beautiful; the son an awkward booby, reared up and spoiled at his mother's apron-string. She knotted our ribbons very tightly so that we should not lose them,—they pulled the little hairs under our curls and made us "ooch" and wriggle. Then Dede gave us little smacks and called us boobies. Any of various large tropical seabirds from the genera Sula and Papasula in the gannet family Sulidae, traditionally considered to be stupid. We found on St. Paul's only two kinds of birds—the booby and the noddy. The former is a species of gannet, and the latter a tern. Both are of a tame and stupid disposition, and are so unaccustomed to visitors, that I could have killed any number of them with my geological hammer. In the game of croquet, a ball that has not passed through the first wicket. 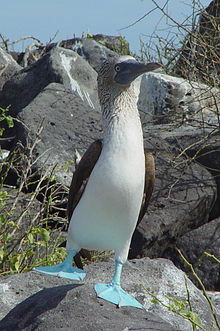 A booby may displace another booby or a bridged ball by roquet, ricochet, or concussion. (まれに, intransitive) To behave stupidly; to act like a booby. (transitive) To install a booby trap on or at (something); to attack (someone) with a booby trap. From the earlier form bubby. At ten o’clock she was lying on the divan with her boobies in her hands. She is beyond hot: her long, black, curly hair cascades around her naked boobies!